What’s not to love about a Hershey’s Kiss? It’s such a perfect little morsel of chocolatey goodness. I’d have to say the only problem I have with them is having enough patience to methodically unwrap each of the little guys when I am just anxious to shove a whole handful into my mouth. Well, I guess I’m burning half a calorie unwrapping, right? Hershey’s has been coming out with a lot of limited edition flavors of Kisses lately like the Candy Addict favorite Cherry Cordial Kisses, Special Dark Strawberry Kisses, and even Candy Cane Kisses. 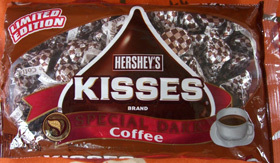 Recently, I was lucky enough to find Hershey’s Special Dark Coffee Kisses. I love coffee, and I love coffee-flavored chocolate, so I had high hopes for these nuggets! I think my hopes were a little too high. These Kisses aren’t bad, but they aren’t all that great, either. I’ve had the same bag for several weeks now, which is telling–if I really liked them, they would have been gone in a couple of days! The coffee flavor is sort of a sweet, syrupy coffee flavor, reminiscent of an artificial coffee flavoring. The coffee flavor, coupled with the dark chocolate, leaves a slight, somewhat sickly sweet aftertaste. I think I’ll stick with the regular Kisses and maybe try the peanut butter ones and, yes, I really need to try the Cherry Cordial Kisses to be a true Candy Addict, don’t I? Its too bad they didnt taste better – although I bought a limited edition coffee kit kat for my husband, who loves kit kats, and he didnt like that one either. These sound like the bite-size version of a Hershey’s limited edition espresso-flavored Special Dark that I had last year. I, too, had such high hopes (being a lover of coffee-flavored chocolate), but that fakety-fake coffee taste just mucks up the whole affair. Too bad. In a slightly related topic I found a bag of the Chocolate Truffle kisses at my local Walmart and I do believe I have a new favorite candy. The chocolate is really smooth and creamy and unlike every other truffle I’v had that has a coating, you can’t remove the coating from the truffle. Even better is there is no bitterness at all from the dark chocolate coating. You guys definately need to grab a bag and review these. THE WAY hersheys Where can we find some here IN IDAHO HAD SOME AT CHRISTMAS OUR DAUGHTER SHARED HERS WITH US. I’m surprised you guys don’t like this version of kisses! My coworker has some on her desk and I’m always sneaking a few during the day! I like the bitter taste of the dark chocolate mixed with the coffee…it’s very soothing. OMG! My family absolutely loves these, and I do drink my coffee with sweetener and cream! However, I also love the chocolate covered espresso beans, and these have that same really dark flavor. Our problem is that we can’t find them here in the Dallas, Texas area – any ideas??? me up in the mid day…..
you should tell where to find the chocolates. 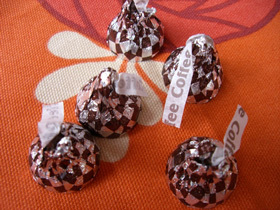 such as the coffee hershey kisses!! Espresso” chocolate bars (biggest size – no kisses). pleez pleez pleez please PLEASE! P L E A S E ! !